Arlo already offers wireless cameras and security lights, and now it's branching out to another popular smart home arena: doorbells. The new Arlo Audio Doorbell is coming soon to help you keep an eye on your entryway. Well, not an eye... but an ear. The Audio Doorbell doesn't have a camera like other smart doorbells, but you also don't have to screw around with the wiring inside your house. The Audio Doorbell takes a pair of AA batteries, so it's not rechargeable like other Arlo devices. However, those batteries will keep the doorbell running for about a year. It's only streaming audio, so it won't use much power. When someone presses the button, you get a "phone call" from the Arlo app on your phone. Answering starts a 2-way audio conversation via the Audio Doorbell. Pairing the Audio Doorbell with other Arlo devices can make it more capable as well. For example, there will be an Arlo Chime (above, right) that plugs into an outlet inside your home. It'll ping you when someone presses the buzzer, but you can also set it to silent mode. There's an 80dB alarm option, too. If you have Arlo cameras, you can integrate the video feed from those devices into the Audio Doorbell experience. Arlo has not announced a price or release date, but you can sign up for notifications on the website. It says to expect the doorbell to launch sometime this fall. SAN JOSE, California — July 23rd, 2018 — NETGEAR®, Inc. (NASDAQ: NTGR), the worldwide leader in home networking and smart home security products, announced today the all-new Arlo Audio Doorbell and Arlo Chime. 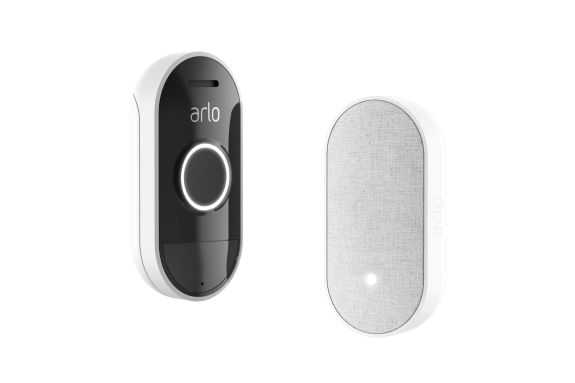 Designed with flexibility and DIY simplicity in mind, the Arlo Audio Doorbell and Arlo Chime are built to work as a smart audio doorbell solution or to pair with Arlo wire-free cameras or Arlo smart light for a more complete view of the entryway. Through the free Arlo app, users can access their Arlo Audio Doorbell to interact with visitors from their smartphone or tablet, and if paired with an Arlo wire-free camera, users can also use an Arlo Smart subscription service plan to intelligently detect people and call e911 emergency services closest to the camera’s location, saving valuable time. The smart audio doorbell solution is slated to arrive in retailers nationwide later this fall. The Arlo Audio Doorbell is easy to install, replaces traditional push-button doorbells and calls the user’s mobile device when the doorbell is pressed. Homeowners can then speak with, or if an Arlo wire-free camera is paired with the doorbell, even see their guests directly from their smart device. Users can then talk live with visitors through their mobile phone or tap to reply with a prerecorded message while in a situation where it’s not convenient to talk. 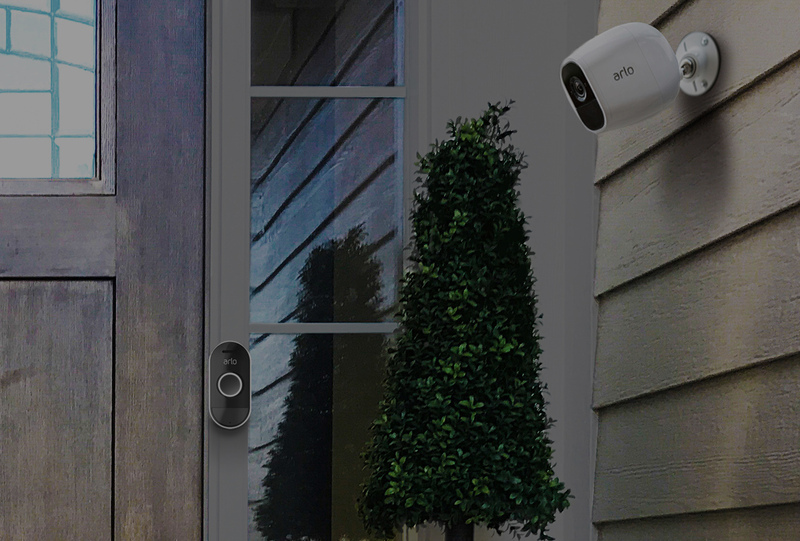 The freedom to mount Arlo wire-free cameras anywhere around the front porch enables Arlo Doorbell users to keep watch over their entry with a more complete view as opposed to conventional smart doorbell solutions which integrate a camera in a fixed position next to the doorbell button. The Arlo Audio Doorbell runs on two standard AA batteries, which has longevity to last up to an entire year, and is finished with a weather-resistant exterior. For added ease and versatility, users also have the option to connect with their existing digital and mechanical door chimes without needing to install any additional hardware or wiring. The all-new Arlo Chime accessory complements the Arlo Audio Doorbell and completes the smart entry experience. By plugging into any standard power outlet, Arlo Chime works in tandem with the Audio Doorbell and Arlo wire-free cameras to transmit instant alerts to any room where plugged in, even if users are not near their phones. With volume control and options for melodies that can be adjusted via the free Arlo app, Arlo Chime can also produce an audible alert loud enough to serve as an 80+ decibel siren. Silent Mode can also be activated to disable alerts and disruptions – perfect for families with napping children or other times when silence is golden. The Arlo Audio Doorbell, Arlo Chime and Arlo cameras and security lights are all easily managed through the Arlo App, available as a free download from the Apple App Store or Google Play Store. In addition, Arlo users can add on Arlo Smart – the recently launched subscription services plan that utilizes intelligent algorithms and advanced analytics to deliver more personalized, meaningful notifications and added peace of mind. Arlo Smart delivers customized alerts and an e911 Emergency Call Service, which allows users to contact emergency first responders local to the camera, not where the user is at the moment, with a simple tap on their mobile device. Available for every Arlo camera, Arlo Smart service plans also extend the availability of cloud recordings up to 60 days and start at just $2.99 per camera per month, or $9.99 per month for up to 10 cameras. For a limited time only, Arlo is offering aone-month free trial of the Arlo Smart Premier plan to new subscribers. Please visit Arlo.com for more information on the full range of Arlo Smart Home products and services. Has the YouTube TV price bump pushed you to unsubscribe? Nope, I'm keeping my subscription. Yep, too much for me. Never had it to begin with. I subscribed because of the increase. [Bonus Round] Evil Dead: Extended Nightmare, Ailment, Doors & Rooms: Escape games, Fireballz: Lava Labyrinth, PGA TOUR Golf Shootout, and Block Shooter! Updated: [Download] CyanogenMod 7 For The HTC Thunderbolt (Pre-Alpha) Now With Fast Mirror! Notice a bug? Let us know here.